Advertising standards and clichés are all in the past. Nowadays, only effective and uncommon solutions are successful. Location and time are important. 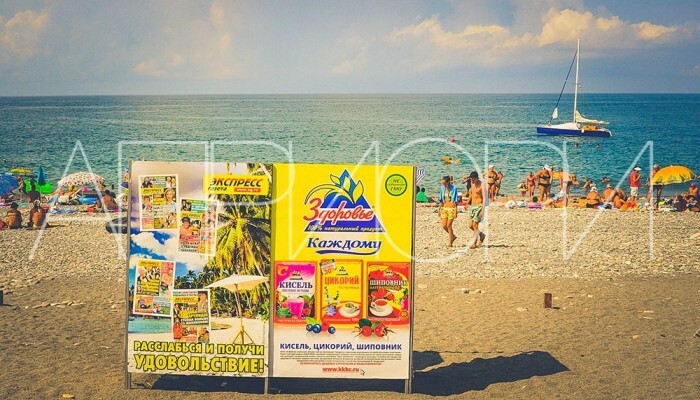 The sea, beach, summer and mountains, all of it makes a perfect formula for the best advertisement. It became company’s professional element. 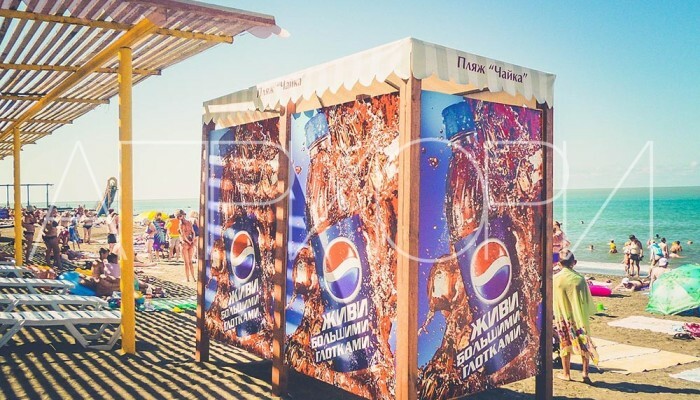 The sea is not only about sand, tender sun and boating . 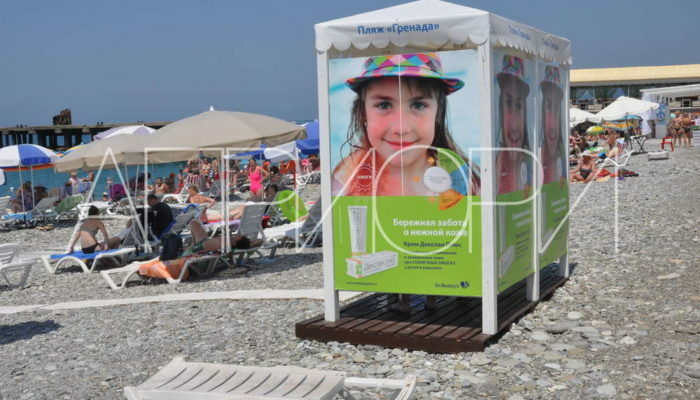 It’s also an advertisement on a branded parasols and sun loungers, changing rooms (city-format 1.2*1.8m), lamp post with advertising light boxes along promenades. 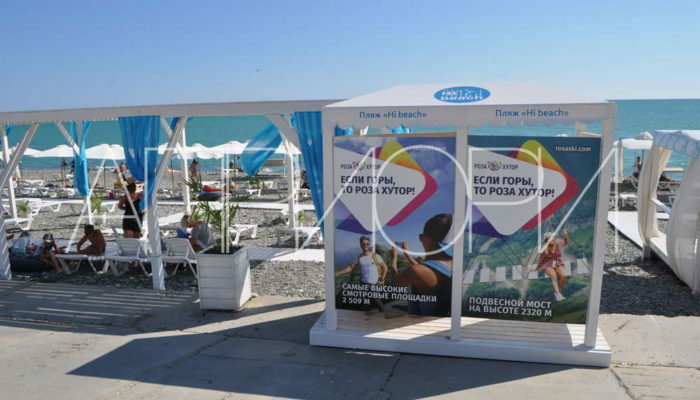 An integral part of the resort service - effective carriers of direct advertising. 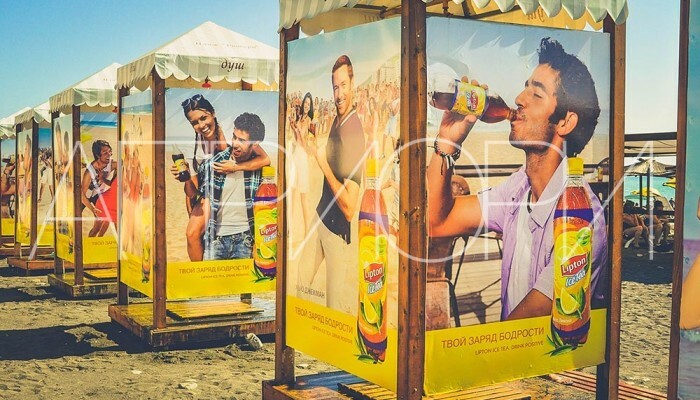 In addition, it is an excellent platform for a variety of activities at a beach such as street promo, sampling, giveaways, parties, concerts. 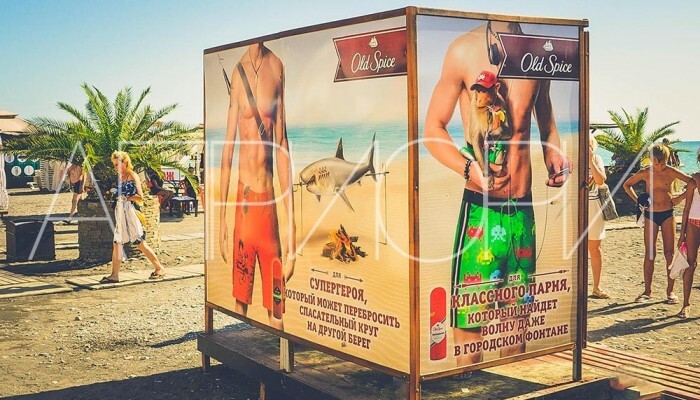 A changing room is a simple but functional structure. 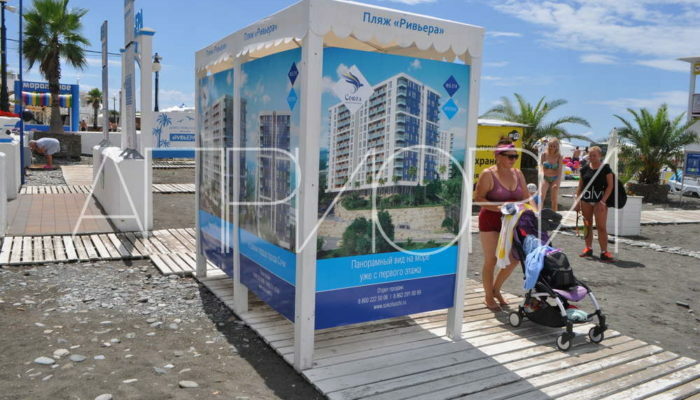 Design features are subject to an individual requirements of each beach area. 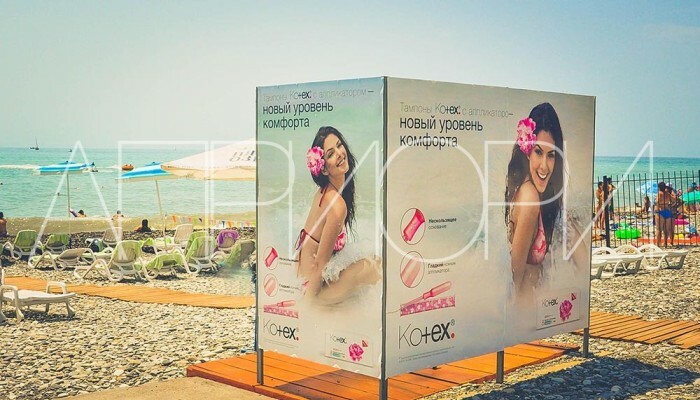 Shower stalls and massage tents are also among the objects of direct advertising. 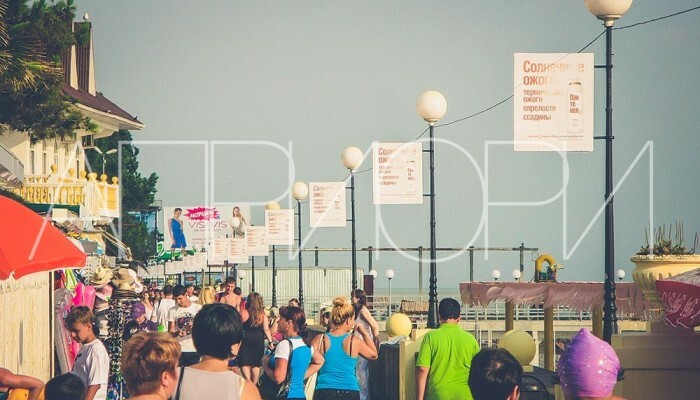 Peculiar elements on the lamp posts with light boxes along the waterfront are all the same format. 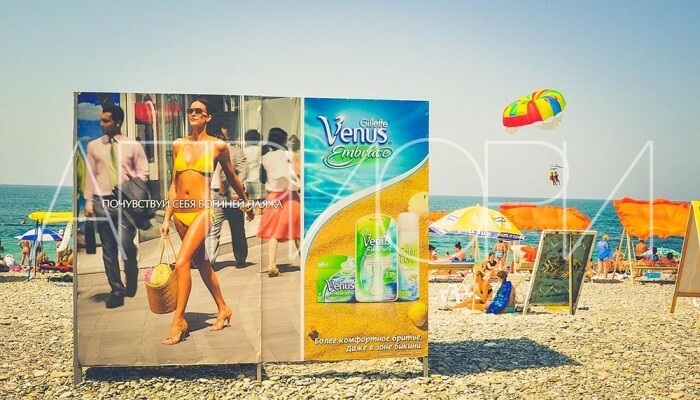 Advertisement on it is perceived naturally, looks aesthetically pleasing and gives only positive mood. 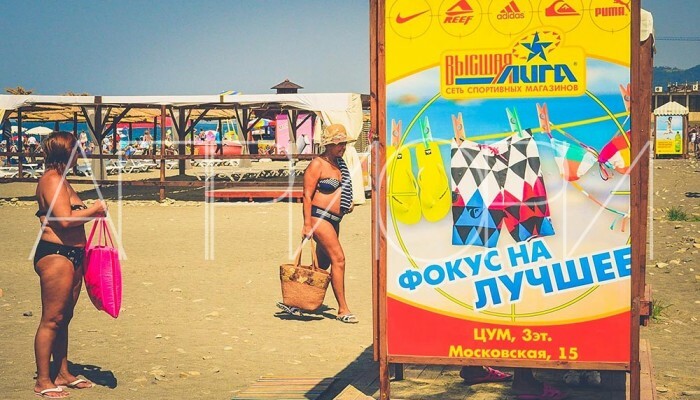 The beach is a popular holiday destination. 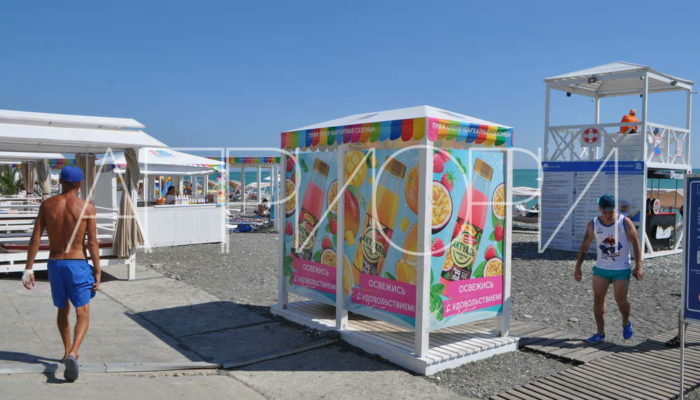 The same applies to the promenade areas of the waterfront where the speed of resort life does not cease, day or night. 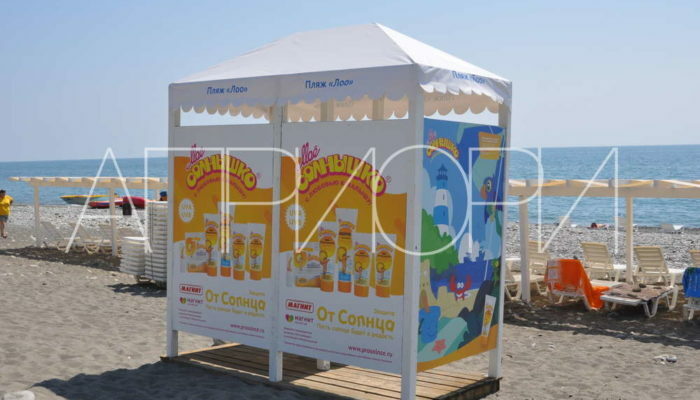 Promotional beach - one type of services that the company offers. 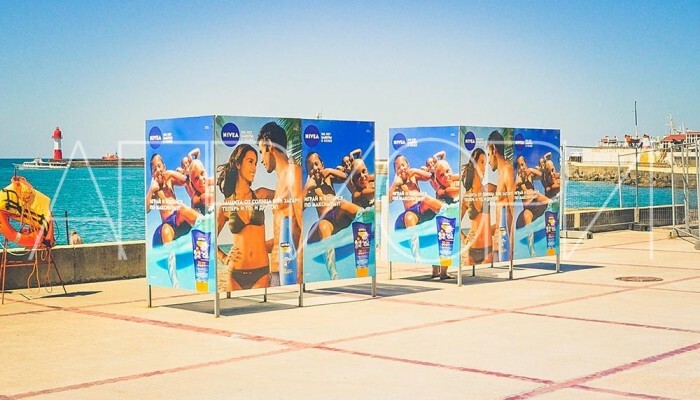 The territory of the city beach is a public place, with its own rules and regulations. 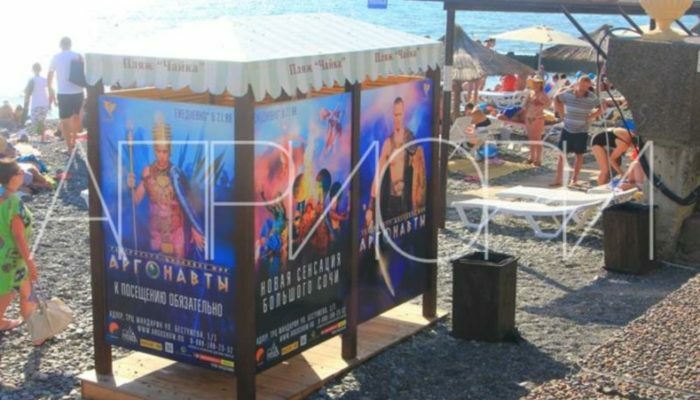 To organize any beach event - promo, parties, shows – you need to take care of booking to arrange all activities without any hesitation. THE EXPERINECE THAT WILL MAKE YOU THE BEST. 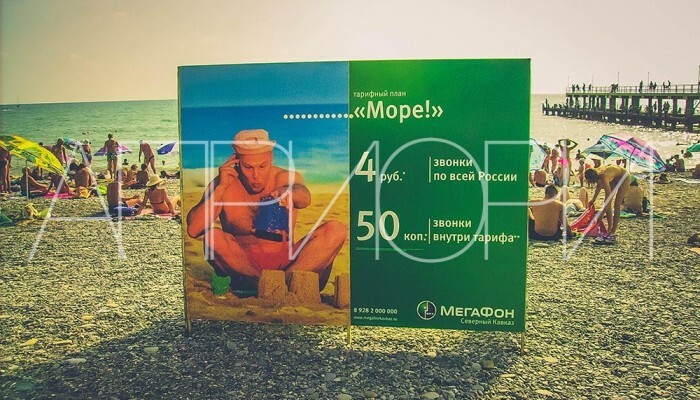 We create the right advertising. So we speak the language of here and now about values and belief system. 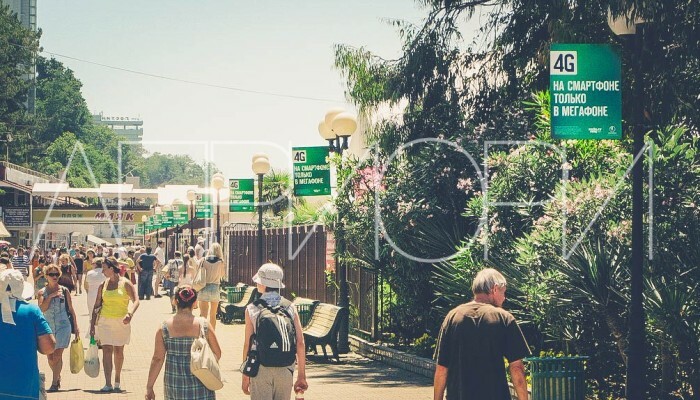 We have fertile ground for creativity. 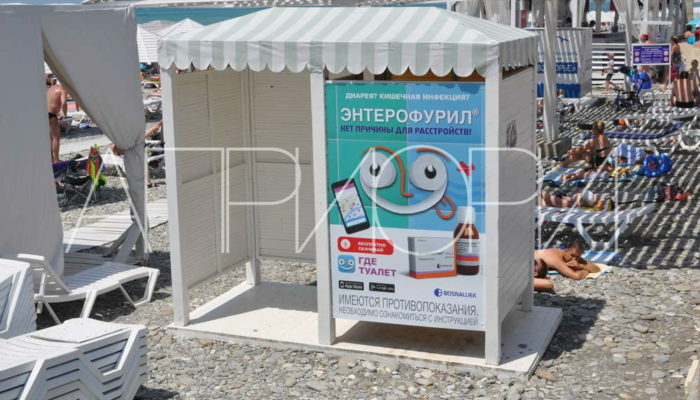 Such advertising is a useful companion of everyday life and holidays, days and nights, at the beach and high in the mountains. It is the quality standard of today's reality not just information noise. Kind or strict, ridiculous or pretentious, with a complaint or about nothing – each one of it is very different from one another. 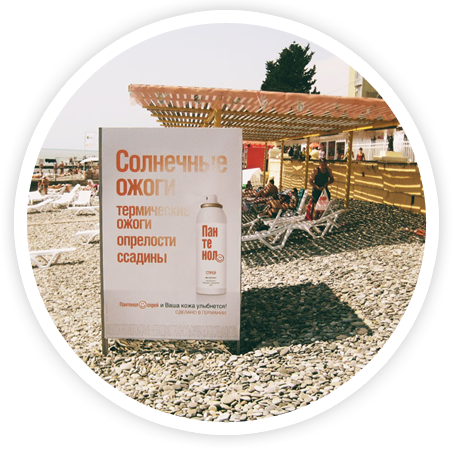 Advertising on the beach does not take away but offers easily with positive in its own character in the contrast of white and black. And, doubtless, offers something better than what was yesterday. 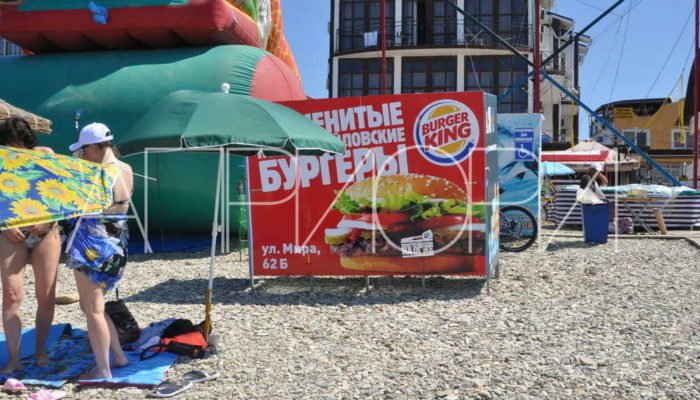 There is hardly anybody that remembers that Sochi has already claimed the Olympics once in the 90s. 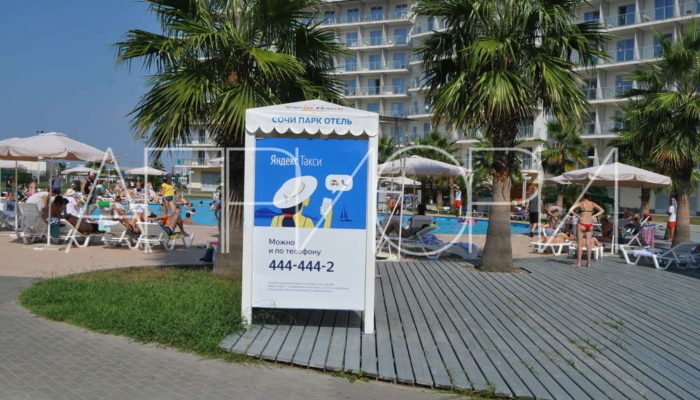 It took much more time in order for the whole world to speak about the Black Sea resort. 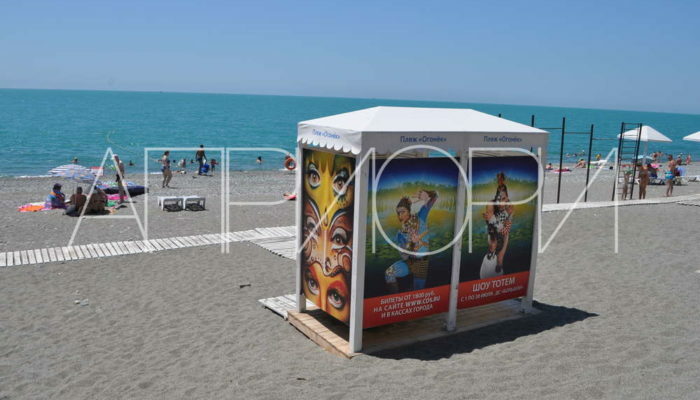 Sochi today is not only a world-famous city. 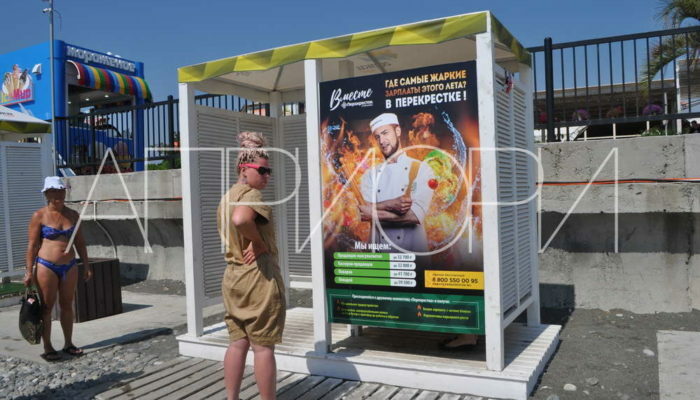 It is an extensive length along the Black Sea coast over 140km which is an all-time favorite tourists’ place, nowadays, and a great platform for advertising campaigns. THE SEA, SUN AND SAND. WE ARE HERE TO HELP YOU TO MAKE MONEY ON IT .